This weekend we went to the New York Botanical Gardens to see the giant pumpkins. Pretty big eh? It weighs over 1000lbs!! 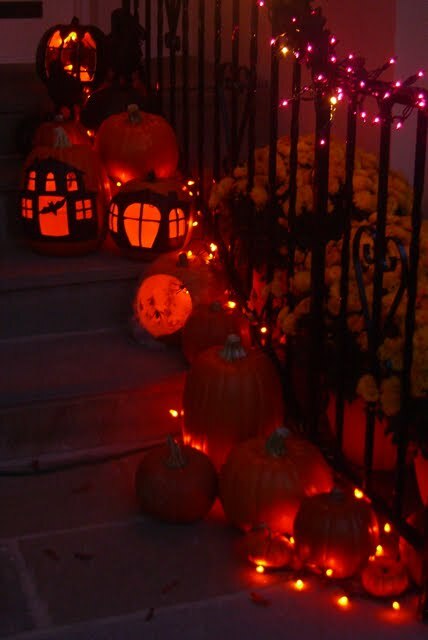 I have also been decorating our front porch for Halloween. Last year I went to Michaels (after Halloween) and stocked up on craft pumpkins that were on sale. This year I discovered that Target sells craft pumpkins too at an even better price point. All the pumpkins have been sitting in our basement waiting to be carved and recently I managed to carve a few for our porch. 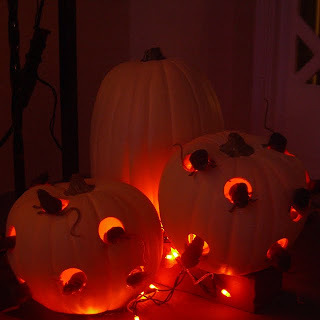 I have used a mixture of craft pumpkins and real pumpkins for our Halloween display this year and orange fairy lights rather than real candles. I hope our craft pumpkins will be used year after year after year. 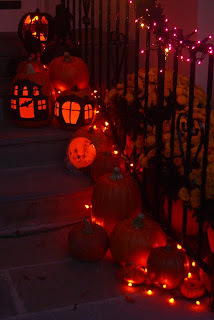 I like the way it looks - but I feel I need lots more pumpkins ... here is a closer look. 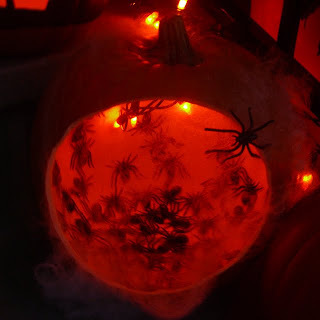 Above is a spiders nest - I used a pack of 100 plastic spiders on the inside of the pumpkin and a little bit of the fake spider web. 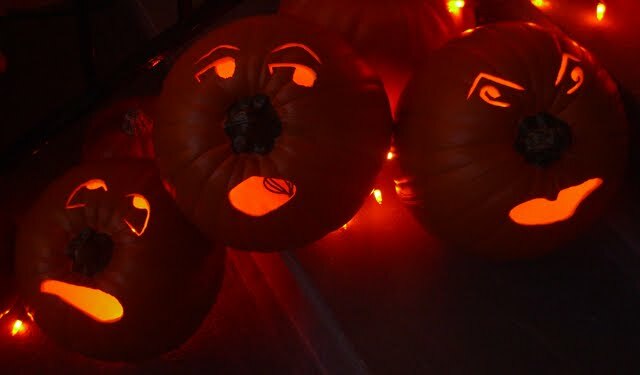 The faces below are an idea from Martha Stewart Pumpkin and Carving Decorating ideas. Each pumpkin has a hole drilled in the back of it and I put about six fairy lights from the string into each pumpkin. This chap my lovely sister carved for us when she was recently here on a visit - it is supposed to be a portrait of her boyfriend. 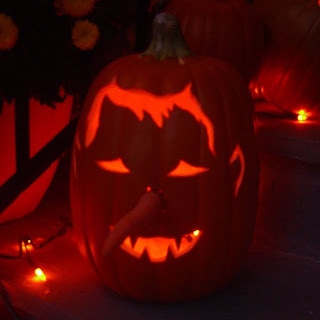 I stuck a carrot in the pumpkins nose hole - but this is no comment on what I think of my sister's boyfriend - he is very nice! And below is another idea adapted from Martha Stewart. 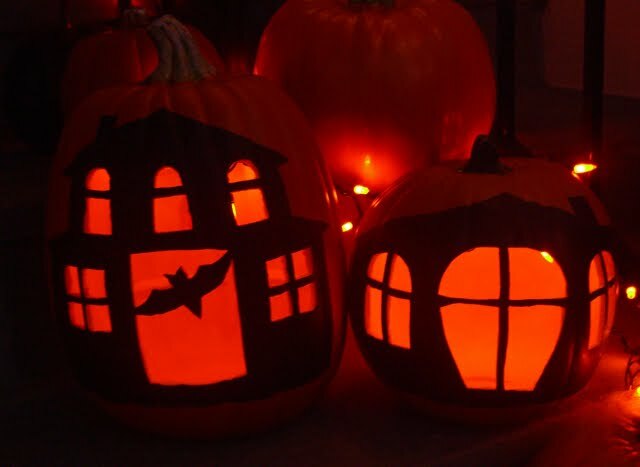 I added black paint to my pumpkin houses and I love them - I shall be making some more for next year - perhaps we will have a whole pumpkin village! 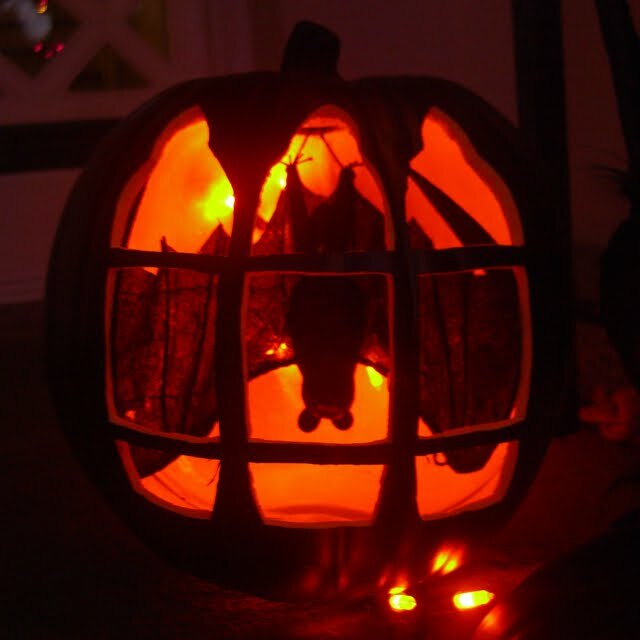 Above is another take on a Martha Stewart idea - but I used a black pumpkin and a bat rather than a vulture. I was a bit disappointed with the mouse house pumpkins below. Maybe too many mice? I love Halloween. Thanksgiving is my husband's favorite and luckily for him that is right around the corner too! You've got some great pumpkins. I especially like the mouse house and the bat cage. Rob is going to carve ours and the dogs get to eat the meat. Yum! 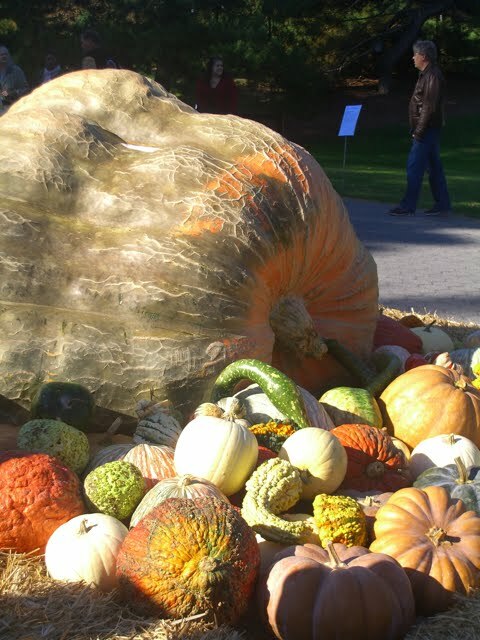 Lovely pumpkin display. I haven't even thought about mine yet. But I do have a couple of real pumpkins that grew in my backyard, planted by some eager squirrels. Rachael, I am so impressed with your carving skills...mine always look like a 3 year old did it! The upside down bat is awesome.